When you have a lot of things that you need to get done, you need to stay organized or you will not accomplish all that you would like to accomplish. You need to stay on track if you are looking to get a lot done, and you need to know that you will have time to accomplish everything. With the help that you get from this To Do Checklist, you can write down all that you need to get done, and you can check off each item as you accomplish it. This checklist will allow you to accomplish all that you need to. Through the help of this simple To Do Checklist, you can write down a wide mix of jobs that you need to get done. Whether you are at home or at work, you will be able to use this checklist to track all that should be done, and to accomplish all that you must. 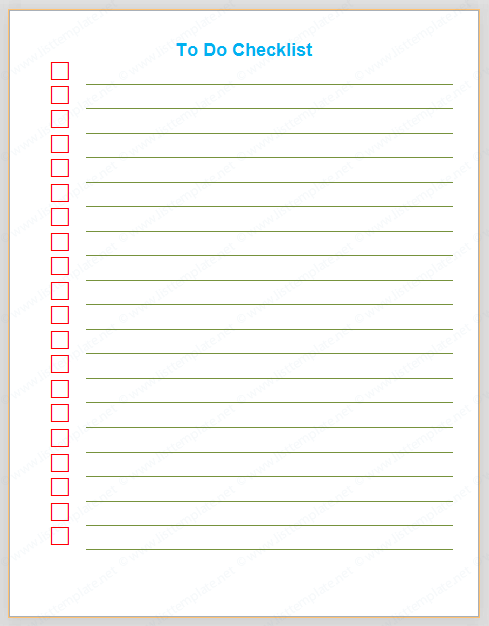 This To Do Checklist has a simple and organized format, a list format that allows you to fill in each job that you need to do on its own line. This template was created in Microsoft Word, and it can be customized in Microsoft Word 2007 or any newer version of the program. This To Do Checklist has a simple and clean format that helps you out as you seek to accomplish all that you need to do. When you are using the To Do Checklist you will be able to fully prep yourself for whatever is to come. Through the help of this checklist you will be able to get cleaning done before you have company coming, or you will be able to get work done before your deadline at the office. This checklist can be used for a variety of purposes, and it will meet your needs.